Our Grand Cayman snorkel charters give you the chance to experience Grand Cayman's crystal clear waters at your own pace in small personalized groups. The snorkeling charter consists of stops at Stingray City/Sandbar, the ex-USS Kittiwake, the Barrier Reef, Starfish Point, the Coral Gardens, secluded beaches and local hot spots like Kaibo, Rum Point, or Calico Jacks. 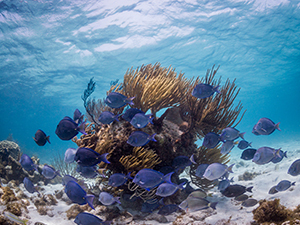 With our snorkeling excursions, you get to choose your favorite combination of the best snorkeling attractions in Grand Cayman to visit during either a half-day or full-day private snorkeling charter. Unlike many snorkel trips, you are not rushed from site to site but are introduced to the underwater world at a comfortable pace and allowed to make new fishy friends. The charter includes entry into all marine parks and environmental interaction zones, masks, snorkels, and fins as well as chilled drinking water and an assortment of snacks. Contact Cayman Turtle Divers to book your excursion to some of the best snorkeling sites in Grand Cayman. WE AIM TO BE THE BEST PART OF YOUR VACATION!